Intended for use in marine areas or which are subject to flood risk for a specified depth and time or in areas with a continuous known depth of water. A test enclosure must be built and subjected to rigorous tests over the defined periods of time and specified depth. 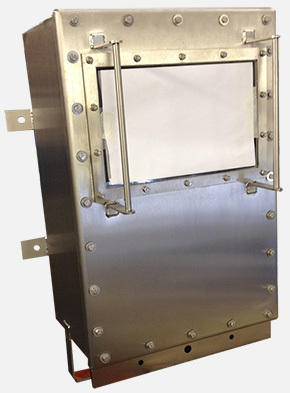 Built to withstand 3m for 2 weeks, and including a viewing window for intermittent internal apparatus inspection, this enclosure passed all the necessary tests by a third party EN body. This is an example of one we have just supplied to a world leader in cable design, construction and installation.